Today, almost every individual uses a mobile phone without being aware of it’s harmful side effects. Like trendy clothes, all want to use trendy mobiles to look fashionable. Flashing costly mobiles is the order of the day. Many carry two mobiles to flaunt at public places. Just Think for yourself. Do You really need to use a mobile all the time? Can you not do your work by communicating on a land line number? Must you converse in trains, buses , malls and other public places? Will your work really suffer, if you wait to get to a land line number? Well, if you sincerely analyze the real necessity of a mobile phone in your work/business, you will probably feel that you are unnecessarily using the mobile most of the times, under the garb of business. Have you ever pondered over the harmful/ adverse effects of mobile usage on your body/brain. Mobile phones and their link with cancer has been an ongoing debate for decades. Reports received after various studies are inconclusive. Some reports point towards brain tumor while some fail to substantiate the same. With proper planning and usage, one can safeguard oneself from the adverse effects of mobiles on our body/brain. Mobile phones and personal communications systems are low-power radio devices that transmit and receive signals in the radio frequency (RF) range 900 and/or 1800 megahertz through a network of base stations. Most countries have brought in regulations to limit public exposure to RF radiation. Exposure to RF radiation can occur from the base station, and mobile phones.The intensity of radiation decreases a few meters from the antenna. Most of the base stations are located in populated areas therefore, those people living in the path of the beam are more prone to exposure to radiations. Every mobile has a transmitter and an antenna. RF energy generated by transmitter (one to two watts) is radiated through Antenna. Most of the energy is absorbed by brain since, mobile is held close to the head. Due to absorption of RF energy (expressed as specific absorption rate- SAR) by human body, the tissue temperature of body increases. SAR is measured in units of watts per kg (W/Kg ) of tissue. However ,If the heat generated is small, the body’s thermoregulatory mechanism can dissipate it without causing adverse effects. If the temperature exceeds this capacity, (about 1 to 2 degree celsius), tissue damage may occur. Penetration of the blood-brain barrier. Spending a lot of time on cell phone disturbs sleep. 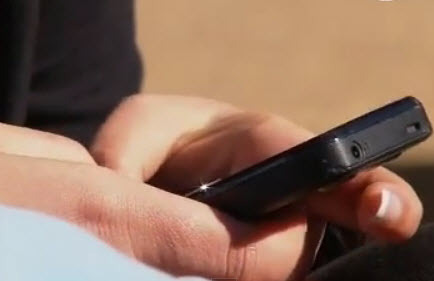 Radio waves from mobile phones do harm body cells and damage DNA. Because of their smaller heads, thinner skulls and higher tissue conductivity, children may absorb more energy from a given phone than adults. The ICNIRP ( International Commission for Non-ionizing Radiation Protection) has recommended RF exposure levels for general public, in terms of power densities, as 4.5 W/m2 and 9.0 W/m2 respectively for the 900 and 1800 MHZ frequency radiations. Exposures below these levels are harmless. Surveys have shown that RF exposure from base stations in areas accessible to public are normally much lower than these guidelines. However, the actual levels depend upon the number of channels, total power radiated, multiplicity of the towers in the neighborhood etc. No surveys have been conducted in India. The onus for demonstrating safety of base stations now lies with service providers. It is in the interest of every individual to use mobiles sparingly to avoid any possible chance of harmful effects of RF radiations on human body. Next time you use a mobile, please think twice-Can you do without a mobile? has recently been linked to various illnesses. affected the blood-brain barrier as well as bone formation in fetuses. experiments and tests being done since 1999.
to look past any harmful effects and simply use their devices until told to stop. A new Greek scientific study has demonstrated how frequency electromagnetic fields, namely cell phones, portable phones, WiFi, and wireless computer equipment, alter important protein changes in the brains of animals. Exposure to electromagnetic frequencies is the result of our advancing technologies, but it is important to study these effects so people know exactly what they’re dealing with in order to take the necessary precautionary measures. The study, entitled “Brain proteome response following whole body exposure of mice to mobile phone or wireless DECT base radiation,” was published in the journal Electromagnetic Biology and Medicine. Important areas of the brain such as the hippocampus, cerebellum, and frontal lobe are regions responsible for learning, memory, and other functions. These areas are negatively impacted by microwave radiation, even at levels below the safety guidelines put in place by the International Commission on Non-Ionizing Radiation protection. Researchers found that 143 proteins in the brain were negatively impacted by radio frequency radiation over a period of 8 months. A total of 3 hours of cell phone exposure were simulated over the 8 month time period, and the results showed that many neural function related proteins’ functional relationship changed the for worse. It is known that short term exposure of microwaves exuded from a cell phone, depending on how far the antenna is from the head, can penetrate as much as 1 1/2 inches into the brain, but this study focuses more on the long term effects and how EMF impacts specific brain proteins. This provides new evidence of the potential relationship between EMF and health complications stemming from EMF such as headaches, dizziness, sleep disorders, and even tumors and Alzheimer’s disease. Another study conducted by a Russian team of researchers also showed that EMF and cell phones cause significant long-term cognitive decline in children. It may be time for parents to re-determine if young children should really be using these devices with growing bodies and developing brains. A number of foreign countries are attempting to adopt precautionary protocols to limit cell phone use in an attempt to mitigate the number of adverse effects they have on human health. In 2011, the WHO/IARC released a report stating that cell phone radiation may have a carcinogenic effect on humans. In fact, the World Health Organization actually said that cell phones are in the same cancer-causing category as lead, engine exhaust, and chloroform. Experts in EMF and wireless technologies are saying that cell phones and similar devices are capable of causing a number of health defects, including depression, body irregularities, infertility and even damaging your DNA. Though known, there is a growing contingent of researchers and scientists coming to terms with the fact that cell phone radiation is having a large effect on human health, causing physical deterioration, mental disorders and infertility. The nature of our society in this day and age leaves little breathing room, however. In a country where cell phone subscriptions actually outnumber the amount of people, you are basically guaranteed to be exposed to cellphone microwaves whenever you enter a social setting. People rationalize that it’s a ‘necessary evil’, and it may be, but the acceptance leads to increased health risk overall. It is for this reason that we recognize the issues and develop a wide-scale solution. Studies on cellphones indicate that the brain is highly affected by any level of exposure, altering its normal function and causing mental disorders. Younger people are more susceptible to damage from cellphone radiation because their bodies are still underdeveloped. Research also shows its carcinogenic effect on the body can produce metabolism problems, affect organs, and cause cancer. These devices are also having an impact on our ecosystem, causing the bee population to become confused, disoriented, and soon die from the signals emitted. Taking steps to avoid exposure to cellphone radiation is important, but it is very hard to completely eliminate the radiation. Simply by talking on your cell phone less will result in less radiation exposure. Even placing your cell phone far away from you instead of in your pocket at all times limits exposure. Although it is a small amount, it is a very simple solution. Another solution for limiting exposure would be to invest in an EMF protector or other similar and very available technologies that reduce exposure. A whole generation of teens can become senile or have brain cancer in the peak of the lives because of mobile phone usage along with other wireless technologies. Fundamental essentials findings from the study released in Environment Health Perspectives. The research, according to intensive utilization of cell phones, could cause apprehension in Western nations since it discloses new ways microwaves can impact our overall health. Leif Salford, the investigator who brought the research which was carried out at Lund College in Sweden, claims that the truth that we under your own accord expose our brain to mobile phone radiation is ?the biggest biological experiment within the history around the globe.? Professor Salford fears that because the wireless technology gets to be more popular individuals will “”drown inside a ocean of microwaves.? The research examined the leakage of albumin within the circulation of bloodstream within the brain. Prior studies from the subject have centered on the chance that mobile phones warmth brain tissue therefore leading to cancer. However the numerous studies attempting to see whether mobile phones cause cancer haven’t been conclusive. Thus, the mobile phone industry in america has handled to reduce findings regarding cellular radiation effects, however the planet Health Organization has had within the research. “”This research proves again that interference with cell activity from the body doesn’t always occur rich in contact with radiation leading to heating from the section of exposure but also occurs with low exposure”” states Professor Rafi Korenstein, a researcher in the College of Tel-Aviv. Inside a study released by Professor Korenstein with many other researchers six several weeks ago (Bioelectromagnetics, 2003), it had been proven that lengthy-term contact with mobile phone radiation can impact the duplication of hereditary substance creating throughout the cell-division process, therefore growing the danger for cancer. Always talk to an empty antenna. Keep your antenna as far out of your ear as possible. Use loudspeakers whenever you can. Answer: E.M.R. describes Electromagnetic Radio-frequency Radiation the potentially harmful frequency released by cellular or cell phones. High frequency ionizing types of radiation is available as X-sun rays, Gamma sun rays and types of nuclear radiation considered to be hazardous . Non-ionizing radiation of lower frequency ionizing forms for example early mobile phones were regarded as safe. That view has transformed since mobile phones and cell phones have become in strength from low-level radio waves to high-level microwaves. No study has proven effectively that using cell phones is hazardous to human health, yet ongoing utilization of greater frequency phones could negatively modify the nervous system, diminish the potency of the defense mechanisms and facilitate the introduction of cancer based on scientific research. Possibly for this reason government authorities and health organizations are investing huge amount of money towards on-going research to look for the long-term results of contact with E.M.R from cellular and cell phones. Answer: S.A.R. or Specific Absorption Rate of Radiation can be used to measure the quantity of radiation that the body soaks up from the source, including cell phones. The F.C.C. (Federal Communications Commission) sets limits in regards to what they considered were safe amounts of radiation from mobile phones. At first when analog phones were 800-900 MHZ of energy, the majority of the mobile phones manufactured met these safe guidelnes. 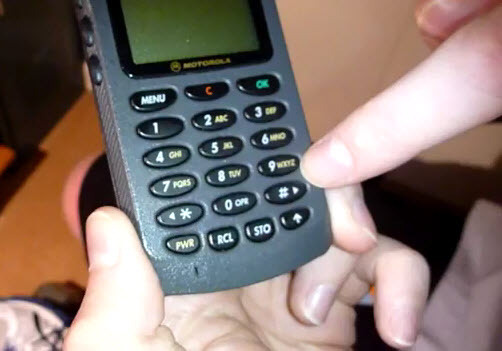 However as producers elevated the energy of the phones as much as 1800-2000MHZ and analog was changed by digital, a lot of the mobile phones now exceed the safe levels set through the F.C.C. Actually the producers still lobby to achieve the levels elevated, so that they may keep growing the energy from the phones. The greatest S. A. R. in your body is incorporated in the ear, thus the worry about excessive mobile phone use and the effectiveness of he signal. How’s S.A.R. measured on the mobile phone? Answer: Whenever a call is created or received there’s a gang of radiation in the antenna, 1 / 2 of which vanishes into space. The rest of the radiation is about the skull, face and ear part of the user and runs with the circuitry from the phone when transmitting the phone call. A dummy mind is submerged inside a gel-like solution much like body fluid along with a mobile phone is connected to the ear. Blood pressure measurements are obtained from the antenna to look for the S.A.R. strength that will change from phone to phone and closeness towards the nearest signal tower. Just in recent months, the WHO, World Health Organization released a statement that mobile phone radiation may possibly be something to become cautious about and may well be a wellness concern. This theory was created following that they had a conference with world researchers, doctors, etc, assessed data from one particular research study via Sweden. that even though all the other months or even years exactly where no genuine judgement regarding cellular cellphone emission can be created, that this year, they finally will. . If this was politically prompted since the WHO, producer of the h1n1virus, SARS and Mad Cow scare, will now be needing far more of a inviting face, no one knows, however their last take on the mobile cell phone emission tale is the fact that if utilised for longer durations, there’s a chance for cancers growing inside the brain. However, a more in-depth look needs to be carried out making emphasis on findings based primarily assumptions plus some too that depending on logic. First off, where do you find that danged antenna positioned? Not long ago, the majority of mobile devices possessed a modest telescopic antenna which you could raise or lower. From that has been designed the tiny stub fixed antennas positioned at the leading of your cell cell phone.. Nowadays, we see the “Patch” antenna, a little wafer roughly 1″ x one half ” in dimension placed behind the back cover of the telephone ( not the batter cover). cellphones generate different power levels. Please note that you will discover cell phones that have their antenna positioned in back of the ear piece, and other people which can be located behind the microphone, or mouth piece. The analysis and data didn’t consider these differences although they are key to whether or not mobile mobile phone emission is dangerous for your wellness. As for iPhones, they have antennas situated surrounding the cell phone from the appropriate side more than the leading for the left side. This redirects the power along a path of roughly 6 ins. Once again, no studies had been performed to identify regardless of whether the distribution of the energy over the 6Inches was different than caused by a patch antenna 1Inch x Inches in dimensions. As for Blackberry a great number of Androids, they’ve the antenna situated inside the bottom of the smartphone in the back. This causes the signal to travel by means of the smartphone and then through the head. Motorola razors are no distinct from the flip devices where the antenna is located close to the mouth piece resulting in the energy to go through the jawbone. It really is easy to ascertain that not all cellular cellphone radiation is going to be the identical. When you’re looking at cellular smartphone output power levels, these vary greatly from nation to country, just as much as wearing does that is a different point given no concern. -What Normal method did they test? -How had been the headsets used versus the phone up against the ear? -What about incorporating a repeater program? -Did the telephone RAD sticker indicate emission levels and exactly where could they be? -How considerably more text messaging versus mobile phone utilization was carried out? Relying singly on information and facts offered from organizations that have an interest in regardless of whether movable telephone emission may be an issue and hazardous for your health may possibly not be your ideal selection. That’s why preserving oneself from such technology prior to any complications happen can make cell cellphone radiation protection a should. EMF should be considered a harmful invader to your body, just like any other environmental toxin. It interferes with your health at the cellular level because you are actually an electrical being. Your body is a complex communication device where cells, tissues, organs and organisms all “talk.” At each of these levels, the communication includes finely tuned bio-electrical transmitters and receivers, which are tuned like tuning into a radio station. What happens when you expose a radio antenna to a significant amount of external noise? You get static from the noise — and that is what is happening to your body in today’s electrosmog environment. Two of the more well-known biological impacts from electrosmog are the interruption of your brain wave patterns leading to behavior issues and the interference with your body’s communication system (cytoskeleton) leading to abnormal neurological function, such as dementia, chronic fatigue syndrome and fibromyalgia. At a cellular level, your cell membrane receptors (the brain of the cell) recognize electromagnetic fields at very low levels of exposure producing a stress response similar to that produced by exposure to heavy metals or toxic chemicals. This can cause the cell membrane to go from an “active” or permeable state where it allows nutrients in and toxins out, to an “inactive” state where the cell membrane is impermeable. During a normal day, your cells will change states thousands of time, but when under constant environmental stress, the membranes can be locked in the inactive state. This is often referred to as “oxidative stress” as nutrients are able to enter into the cell, while toxins (free radicals) are not allowed to leave. There is also real evidence that this inactive state can even have geno-toxic effects, meaning electrosmog is toxic by both damaging DNA and preventing your body from repairing DNA, which can be the first step to cancer. For health, your body must be able to communicate within itself, that is, to be in harmony with the natural rhythm of the earth and all life. The chaotic and unpredictable patterns from electrosmog can create noise in your body and force your body out of harmony. 1. Static Electric Fields: These are made up of static electricity caused by ions released from synthetic materials in your home. When combined, they can make you feel unwell, which underscores the importance of choosing natural materials for your furniture, cabinetry, flooring and other building supplies. 2. Residual Magnetism: Most often this occurs from metal in your bed, which can change its magnetic field. Your body sleeps best in a constant magnetic field, rather than one impacted by metals. (If you hold a liquid-filled compass over your sleeping area, north should always be north; a spinning compass signals residual magnetism). 3. Power Frequency: This includes the wiring in your walls, electrical outlets, extension cords, lamps, and other electricity sources. They produce electric fields that essentially turn your body into a large antenna and interfere with your cells’ ability to communicate with one another. A bedroom disrupted with power frequency is especially unhealthy to sleep in, as cells cannot regenerate properly, potentially leading to insomnia and other diseases. 4. Power Frequency Magnetic Fields: These are caused by building wiring errors and also when power lines to your home run underground near your sleeping area. An electrical panel box located on a wall near your sleeping area or even a refrigerator or TV located on the other side of the wall from where you sleep can also lead to power frequency magnetic fields. 5. Radiofrequency/Communications: This includes a broad range of cordless phones, wireless devices, cell phones and cell phone towers, all of which can interfere with your health. 6. Radioactivity (and its byproduct radon): Radioactivity enters your home from building materials (such as granite — one-third of the granite in homes is radioactive) or radon gas coming up out of the ground. Light and sound are also part of the EMF spectrum, so if you’re near a highway or airport that surrounds your home in artificial light or excessive noise, you can also be impacted by that, although this is less common than the EMF sources listed above. It’s during sleep that your body regenerates and detoxifies, so you want your bedroom to be a sleeping sanctuary with very low EMF issues. It’s a given that you’re going to be exposed to varying levels of EMF during your waking hours, so giving your body a break during the night is really important. First, make sure that your bed does not contain any metal. Research has shown that for your body to properly detoxify during sleep it must be alkaline, and high electromagnetic fields lead to acidity. This is especially true for heavy metal detoxification. • Turning off all the fuses at night (or at least those that are in your bedroom). • Shielding your bed with a special metalized fabric to protect yourself from harmful frequencies that can disrupt cellular communication. • If you are constructing a new home or renovating one and the walls are being rebuilt you can install radiant barrier, which is a tough type of aluminum foil that will also very effectively screen out the EMF. This is what I did for my own bedroom. • At minimum, moving your bed so that your head is at least 3-6 feet from all electrical outlets. If you are constructing the walls you can put the wires inside pipes, which will virtually eliminate the fields that are generated in the room when the current runs through the wire. • Turning off and unplugging everything electrical in your sleeping area, including your computer, WI-FI, cell and portable phones. • Sleeping on a non-metal bed and mattress. • Beware that cell phones and WI-FI are not the only EMF sources you need to be cautious of. Essentially, most all electronics will generate EMFs, including the wiring in your home, electric alarm clocks, electric blankets, computers and lamps, just to mention a few. For best results, avoid using electric blankets and electric heating pads, and unplug all electrical appliances when not in use. Even better, turn off the fuses directly. • Protect yourself from cordless phones. A cordless phone base station placed about two feet from your head and plugged in for three minutes at a time can significantly disrupt your health, including your heart rhythms.The base station of a DECT phone always transmits at full power, so this is not a device you want sitting on your nightstand next to your bed, on your kitchen counter or even on at all if it is not necessary.If you do use a conventional cordless phone, be sure to keep the base station at least three rooms away from where everyone sleeps and where you spend the most time during the day. Or simply keep it off except in the limited circumstances where you feel you need to use it. While driving down any American roadway it is not an unusual sight to see electrical lines, telephone poles, and cell phone towers. You may notice, however, that there do not seem to be enough cell phone towers in comparison to how many cell phone customers exist. This phenomenon is caused by the fact that you are not looking in the right places. Cell phone towers have gone into hiding, disguising themselves as trees, church steeples, and even gas station signs in an attempt to preserve the look of the landscape. Cell phone towers are a necessary element to allow us to transmit our signals from cell phones and must be placed at appropriate intervals along the highway. Unlike other utility towers and poles, these structures are wireless and usually solitary. The number of towers needed in an area is directly proportional to the density of cell phone users. As different cell phone companies use different antennas that are all located on the same cell phone tower, these structures can be quite unsightly. Thus the cell phone tower began to be disguised. Cell phone “trees” have become the most popular disguise that these technological giants assume. These “plants” come in every shape and form depending on what species of trees are close by to help them blend in. This disguise is usually part of a landscape theme or a forest. In the Pacific Northwest, Douglas firs are a popular species that are “planted” among the thick woods and forests in this mountainous region. In southern California, different species of “palm trees” blend in with their natural counterparts along the streets and boulevards. In the desert of Arizona, “cacti” are springing up in the most remote regions. While birds do not nest in these “trees, other wildlife call these towers home, such as various bugs and insects who do not seem to be able to distinguish these “plants” from the natural ones. There are several advantages to these cell phone “trees” that natural trees do not have. The cell phone species do not lose their leaves and maintain their color indefinitely. They never need pruning or trimming and maintain their original shape in and out of season. Cell phone “trees” are also immune to diseases, tree parasites, and drought. These “trees” do not require watering or even soil for that matter. They can survive just as easily in concrete and can be “planted” anywhere. If you are a hay fever sufferer, there is also no pollen present. Opponents argue that these cell phone “trees” are dangerous to the surrounding environment. These individuals point out the fact that was previously mentioned that birds do not nest in these “plants”, explaining that the birds may know something that we do not and claim that these “trees” are a potential health hazard. While there has long been a debate about cancer being linked to power lines and electrical towers, a possible link between this disease and cell phone towers is being hotly debated. Opponents also point out that while these cell phone “trees” look better that the traditional towers, the public may be exposing themselves to potential health hazards without even knowing that the towers are there. 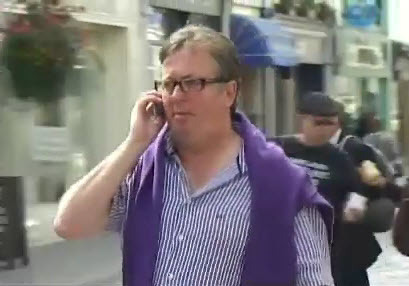 Of course, when these individuals are out locating these health-threatening towers, they are probably calling the locations in to their bosses on their cell phones. 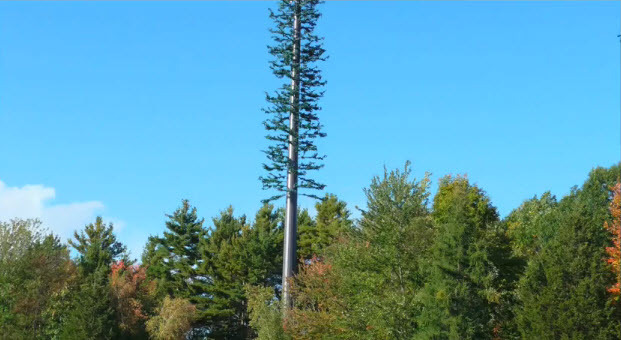 Cell phone towers are a necessity to modern life, and if by disguising these mechanical monstrosities as beautiful trees can help us preserve the natural look of the surrounding environment, most people would agree that it is a beneficial policy.